– 7kgs and 70 cms long – Still in 00’s. – No teeth and no new words this month. She says Gada Gada Gada all day long, and blows raspberries mostly, in addition to what I’ve posted previously. – After being sick this month and losing her appetite completely, I’m happy to say that she is once again eating lots, and all sorts of new things this month, introduced some new meats and carbs. – Still no bottle. Tears. – Not only is Ellie crawling around like the speed of light, but she is pulling herself to stand in her cot, to see what Judd is doing, and to find Daddy at the front window. Keeping track of both kids can be tricky! – Sleeping much better now that she is well again. Still a bit attached to me, but is getting happier to sleep on her own. I had forgotten that when they start moving their sleep tends to get worse, just when you think they will be exhausting themselves more and sleeping better. We’ll get there in time! – Her hair has the water spout up the top! Haha, it is growing so much, I can’t wait to get a clip in it! – Trying to dress her is a sport, she just wants to be off already! – We’ve started to bath the kids together and they just love it, it’s a very fun yet exhausting time of our evenings. – Does this gorgeous big cheesy grin when she does something really clever, squints her eyes up really tight and shows of her gums. It’s beautiful! 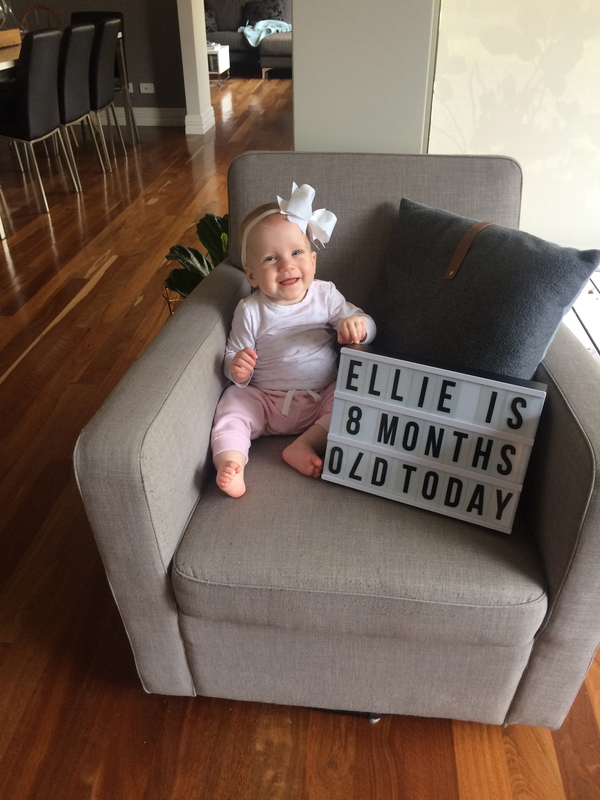 – Ellie loves to sit in her high chair and play with the kitchen utensils while I cook, and I really love that as well. – In the proper trolley seat at the shops. Waaaah! Growing up too fast.